Life Long Learning Starts Today! Building a future for tomorrow. What is Out of School Time? 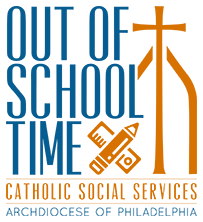 Catholic Social Services first opened the doors of its afterschool programs in Philadelphia over twenty years ago. Its mission is to serve as a safe and academically inspiring environment for over two thousand children. CSS achieves success of this mission by providing opportunities for educational assistance and enrichment though STEM program based learning, 3D Modeling, PBS Design Squad, stop motion animation, and various other activities. Recreational opportunities offered through our programs encourage physical activity; for instance, youth at several of our sites prepared for weeks with a trainer and participated in the Philadelphia Marathon kids run. Catholic Social Services collaborates with the School District of Philadelphia and the Archdiocese of Philadelphia, multiple non- profit organizations like the Alliance for a Healthier Generation and the Free Library of Philadelphia, and local colleges, such as Drexel University’s College of Medicine, to operate its afterschool programming. CSS OST sings the National Anthem!